I found this primitive dresser at a shop in Little Switzerland,North Carolina. I loved it's rustic and simple look. 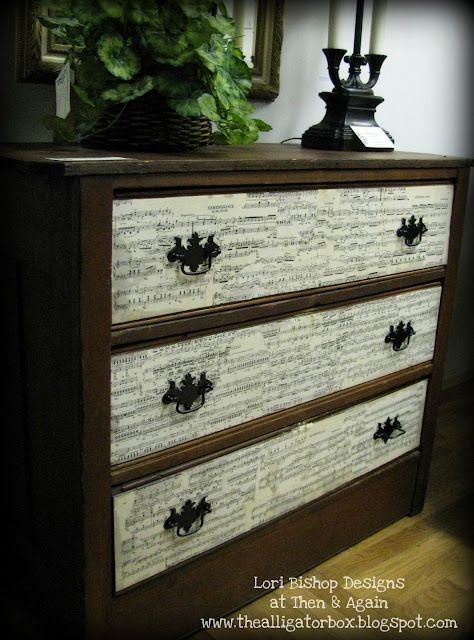 I'm a pianist and when I found an old music book and remembered a similar dresser by Mrs. Mustard Seed, I decided this was the piece to transform. I love it! Do you? I sprayed the hardware with rubbed antique bronze paint. I sealed the music with a polyurethane and when it soaked in on the edges, I thought I had really messed up. After it dried I decided it really added to the aged look. And it's sealed for plenty of use! On a sheet music roll! I've had this lamp for a while and it needed to have a shade update. I decided sheet music was a good option. Now I like the shade better than the lamp! This weekend is supposed to be beautiful and fortunately I don't have much scheduled which means a little time for me to catch up on some painting I want to do! Stay tuned! Love the little dresser! You did a very good job with the sheet music. I like the look of the drawers! What a great idea... 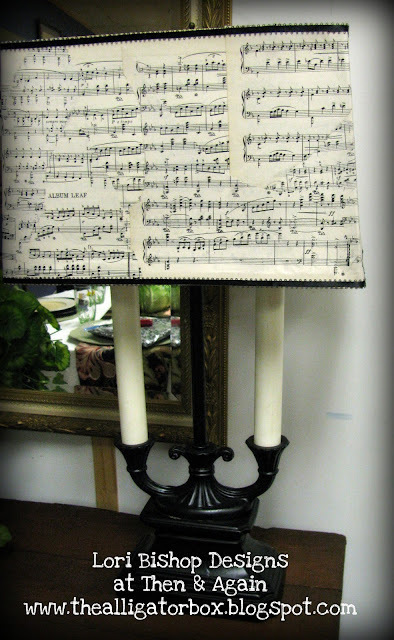 I've seen candles decoupaged with sheet music and i loved that idea too! This turned out BeauTiFuL! I am your newset follower. Come and see what I do over at fineandhandy. blogspot.com. Gorgeous! So glad you joined me. I look forward to seeing more of your projects. Hi Lori! If only I could be Miss Mustard Seed. How does she sleep? :) Your projects are perfect! How did I miss this last week? I love it! Do you print off "sheet music" or do you use old books/pages? Lori! I've only just come across your blog as I was looking at Debbie's Newbie Party (think I'll pop along this week!). 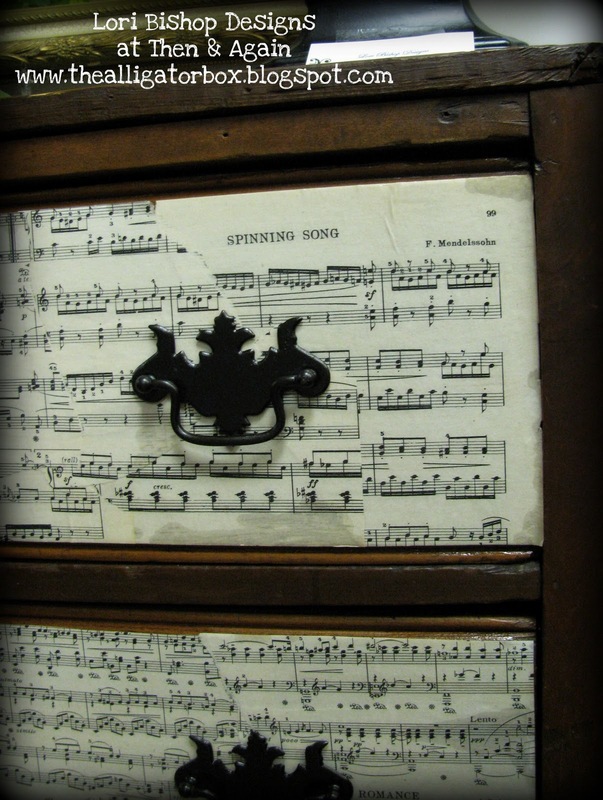 Your sheet music dresser is just so gorgeous - what a fantastic way of revitalising it, I love your matching lampshade too! Hi Lori! I saw you featured at Naturally Me Creations, and I had to come by and see for myself. Looking good! I hope you'll check out my blog, too, at www.meldreamsoften.blogspot.com.